I baked fried these over the weekend. Yummy. I have a new love - deep fried Cinnamon Rolls dipped in vanilla glaze with sprinkles. 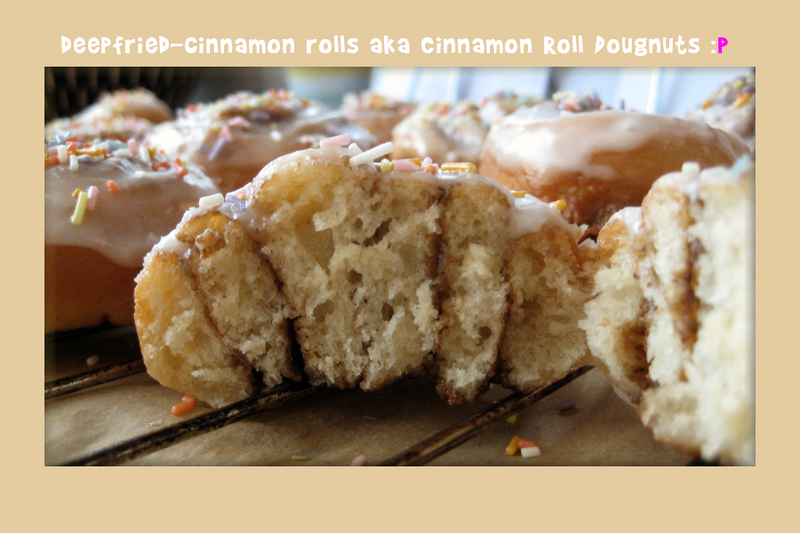 I mean, I always loved a good donut - and I always loved cinnamon rolls - so I combined the two. I'm sure this idea is not even so original, but that doesn't matter, really. I recommend you try them. Recipe posted here at my other blog--gig! And I'm trying out another main course meal next Monday. It's going to be my thing over the next couple weeks to try out some recipes on Monday nights until I feel like I've tried out most of the book. You know what is really lame, one of my peeves I guess, when you go on Amazon and you read the book reviews and some people give a book like 1 star and they've only tried one or two recipes. I don't think that's fair. I think you should try out at least 50% of the recipes before you can fairly judge it. That's just me I guess. So that is the plan here. One last item here: Babi Pangang. I mentioned it last week. I made it last Friday night - at least one version of it. It wasn't that bad but it wasn't that good either. So, now from here on out on Friday night we will be eating Babi Pangang. A different recipe every week until we find the one that we like. So, note to self: do not use that version again... no good. Too sour. And for some reason the pork was very dry. Gotta figure out how they bake it so crispy on the outside and tender inside. Perhaps with the slow cooker?